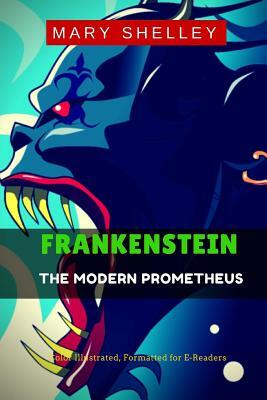 Unabridged & Original version with all 362 pages Includes: 15 Illustrations and Biography Frankenstein; or, The Modern Prometheus, is a novel written by English author Mary Shelley about the young student of science Victor Frankenstein, who creates a grotesque but sapient creature in an unorthodox scientific experiment. Shelley started writing the story when she was eighteen, and the novel was published when she was twenty. The first edition was published anonymously in London in 1818. Shelley's name appears on the second edition, published in France in 1823. Shelley had travelled through Europe in 1814, journeying along the river Rhine in Germany with a stop in Gernsheim which is just 17 km (10 mi) away from Frankenstein Castle, where, two centuries before, an alchemist was engaged in experiments. Later, she travelled in the region of Geneva (Switzerland)-where much of the story takes place-and the topics of galvanism and other similar occult ideas were themes of conversation among her companions, particularly her lover and future husband, Percy Shelley. Mary, Percy, Lord Byron, and John Polidori decided to have a competition to see who could write the best horror story. After thinking for days, Shelley dreamt about a scientist who created life and was horrified by what he had made; her dream later evolved into the story within the novel. Frankenstein is infused with elements of the Gothic novel and the Romantic movement and is also considered to be one of the earliest examples of science fiction. Brian Aldiss has argued that it should be considered the first true science fiction story, because unlike in previous stories with fantastical elements resembling those of later science fiction, the central character "makes a deliberate decision" and "turns to modern experiments in the laboratory" to achieve fantastic results. It has had a considerable influence across literature and popular culture and spawned a complete genre of horror stories, films, and plays. Since publication of the novel, the name "Frankenstein" is often used to refer to the monster itself, as is done in the stage adaptation by Peggy Webling. This usage is sometimes considered erroneous, but usage commentators regard the monster sense of "Frankenstein" as well-established and an acceptable usage.] In the novel, the monster is identified via words such as "creature," "monster," "fiend," "wretch," "vile insect," "demon," "being," and "it." Speaking to Victor Frankenstein, the monster refers to himself as "the Adam of your labours," and elsewhere as someone who "would have" been "your Adam," but is instead "your fallen angel.